When web design has a greater purpose. A corporate site that conveyed the organization’s purpose and achievements. A secondary site for a division that is funded by the Office of Child Care and offers more direct support. Tight Deadline. Firm Budget. No Problem. They needed web design done quickly, expertly and within their strict budgetary constraints —and these were not simple sites. They called for locator tools that pulled information from different databases across all 50 states as well as 508 compliancy. They also needed to be multi-lingual. We looked at their requirements and thought again about the greater good we would be doing. Taking on this project for Child Care Aware was truly a no brainer. Website design when information is critical. All websites convey information, some more visually than others. But for some sites, the information that needs to be made available to visitors is vast. Child Care Aware’s content was low on pictures and big on that killer of no-bouncing: words. Our web design needed to organize the content in a way that would be palatable to visitors—most of whom do not want to encounter pages of endless paragraphs. So we arranged the information accordingly. When you visit both usa.childcareaware.org and childcareaware.org, you’ll note that the text is peppered with pictures of smiling kids—who doesn’t love that? The images, along with the color scheme, make the site feel welcoming. Plus information is presented in digestible nuggets with links to more. When you glance at the navigation, you can easily see how robust and content heavy this site actually is. Conveying information in a manner that visitors won’t ignore is just good web design. 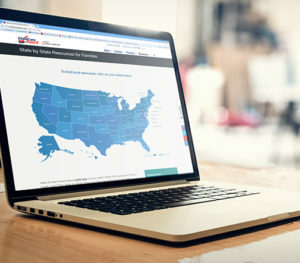 Nationwide resources at a click. 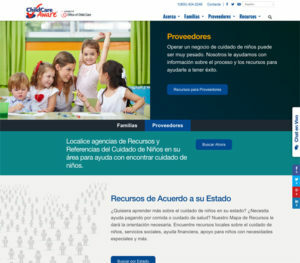 Because the mission of Child Care Aware is to provide families with quality childcare resources, the websites needed to feature locator tools that allowed visitors to pull up information for their individual state agencies. Families can search for local Child Care Resource and Referral agencies by state, zip code, county and specific address. Creating this seamless functionally was fairly difficult. But we prefer to do the hard work needed to make searching features easy for web browsers. Website Design that accommodate everyone. 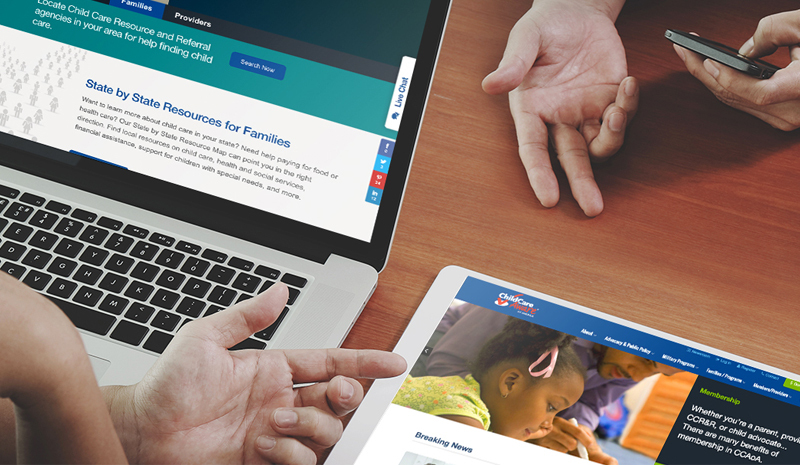 When working with federal and non-profit agencies, there are added steps to building a successful website. One of these is ensuring that the website design is 508 compliant. 508 compliancy refers to Section 508 of the Rehabilitation Act of 1973 that requires federal agencies to provide software and website accessibility to people with disabilities. These requirements include things like highlighted links and buttons that describe what they lead to rather than stating vague calls-to-action like learn more. After studying all the ins and outs, we are proud to announce that both of the childcare aware website designs are 508 compliant. Multi-lingual sites for a multi-language audience. Our clients translated the content for us (phew), but we were tasked with creating multi-lingual sites to expand access. The way these sites work is that the website pops up in the language the browser has been set to—a pretty neat feature. Visitors don’t have to rely on browser translators. The words come up magically in their own language. The greater good feels good. Now that both usa.childcareaware.org and childcareaware.org are both up and running, we are thrilled at how smoothly they function, and at the small role we’ve played in helping families across the country satisfy their childcare needs. We’ll meet any website design challenge. Contact ACS Creative Services with your project today.